More than 2 million times every year, individuals with serious mental illness are arrested. Moreover, more than half a million people with serious mental illness are incarcerated at any given time. In fact, 44% of jail inmates and 37% of state and federal prisoners have a history of a mental illness. 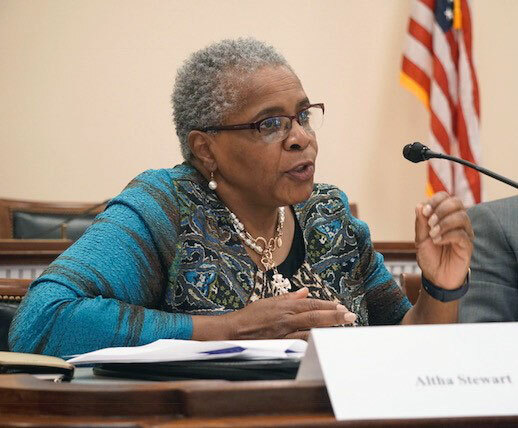 “Those numbers are staggering no matter how you look at them,” said APA President Altha Stewart, M.D., at congressional briefing titled “Innovations and Challenges in Providing Mental Health Services to People in Prison and Those Reentering the Community.” APA was one of the sponsors of the briefing. Driving the crisis are the higher rates of arrest of people with mental illness for petty crimes directly related to their disorder, such as public nuisance, public urination, drunkenness, or behavior perceived by others as dangerous, said Stewart, who is also a professor of psychiatry and director of the Center for Health in Justice-Involved Youth at the University of Tennessee Health Science Center. Longer stays for people with mental illness, coupled with low utilization of evidence-based treatments during incarceration, compounds the problem. Psychiatrists are the most highly trained, highly skilled physicians to manage the treatment of incarcerated individuals with serious mental disorders, yet are underrepresented in correctional settings, with typically just one provider for every 150 inmates, Stewart said. The costs, too, are staggering: total expenditures on prisons is nearly $43 billion and states are spending $33,000 per inmate per year. To help prevent recidivism and encourage successful reentry into the community, Stewart urged support for HR 4005, a bipartisan bill introduced by Rep. Paul Tonko (D-N.Y.) to permit the use of federal Medicaid funds for health care services for incarcerated individuals during the 30-day period preceding their release. Currently, under Title XIX of the Social Security Act, federal Medicaid funds are prohibited to be spent on people who are incarcerated. Securing an individual’s Medicaid coverage prior to their release would give individuals “a leg up and reduce their risk of relapse of mental health conditions or overdose while also lowering their risk of recidivism back into the criminal justice system,” Stewart said. Robert Morgan, Ph.D., chair of the Department of Psychological Sciences at Texas State University, said that by treating inmates for mental illness only, prison systems are missing half the equation for helping these individuals. Instead, research has zeroed in on several central “criminogenic risk factors” that increase people’s risk for becoming enmeshed in the criminal justice system, regardless of whether they are mentally ill. These factors include antisocial behavior and personality traits, antisocial associations, criminal thinking and associates, family problems, marital problems, and poor work or school performance. “We need to target the issues that are putting these people at risk for future contact with the criminal justice system,” Morgan said. Services aimed at reducing the criminogenic factors are no more expensive than traditional programs, yet result in a 30% to 50% reduction of recidivism, depending on the type of service provided. For instance, one such program in a probation office in Texas was associated with a reduction in participants’ re-arrests by 50% at the two-year mark, he said.